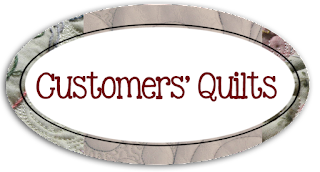 How nice to be sharing a quilt with you, rather than sneak peeks! As has become the 'norm' in recent posts!. 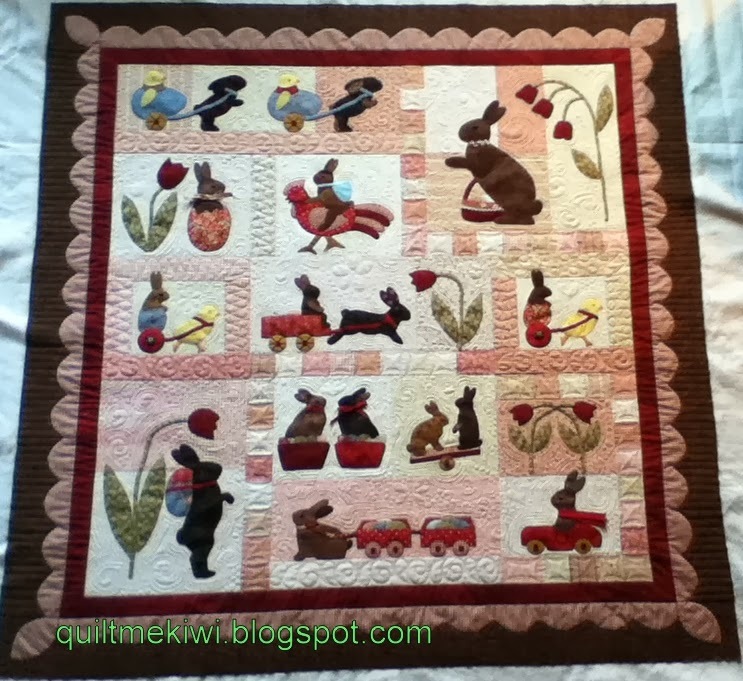 Gaynor has made a lovely job of this Bunny Hill pattern called "Rabbits Prefer Chocolate". This will make a lovely addition to Gaynor's Easter display. 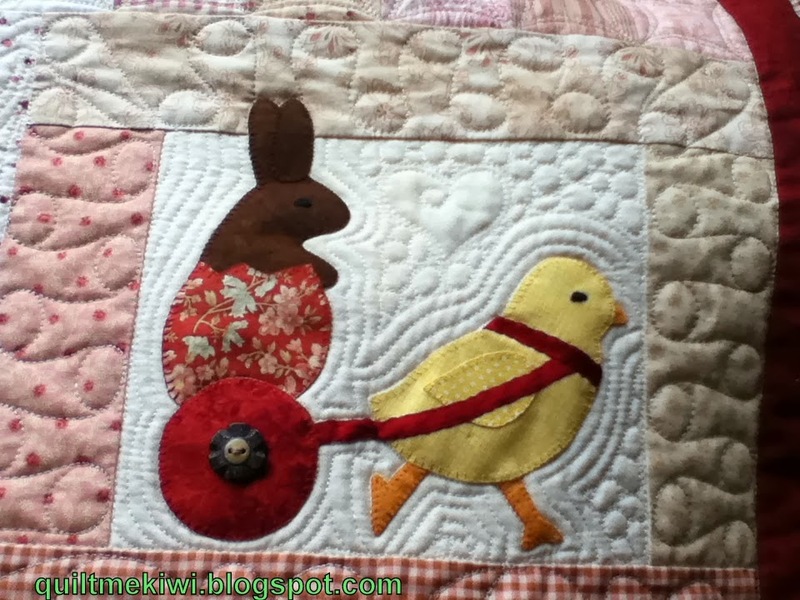 I remember assisting Gaynor last year at the shop to choose fabrics for this delightful quilt. 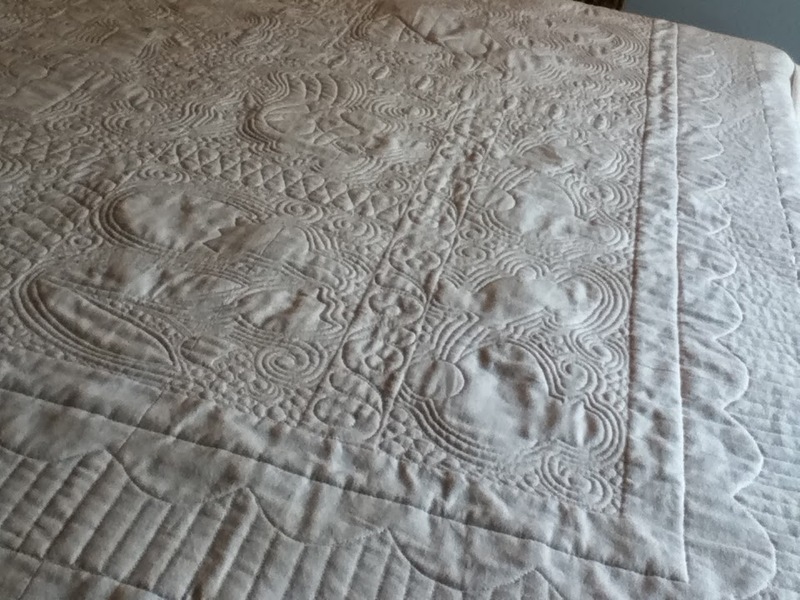 Ok enough talking, here's what you came for, the quilting! Quilting over cotton batting, using a mix of Gunold, Madeira poly neon & glide threads. Some echoing, swirls, pebbles & even some hearts & flowers. see the tulip I quilted? A view of the back. For the border I quilted piano keys, if you missed how I did this see my previous post here. So if you think Rabbits only ate grass, think again!! 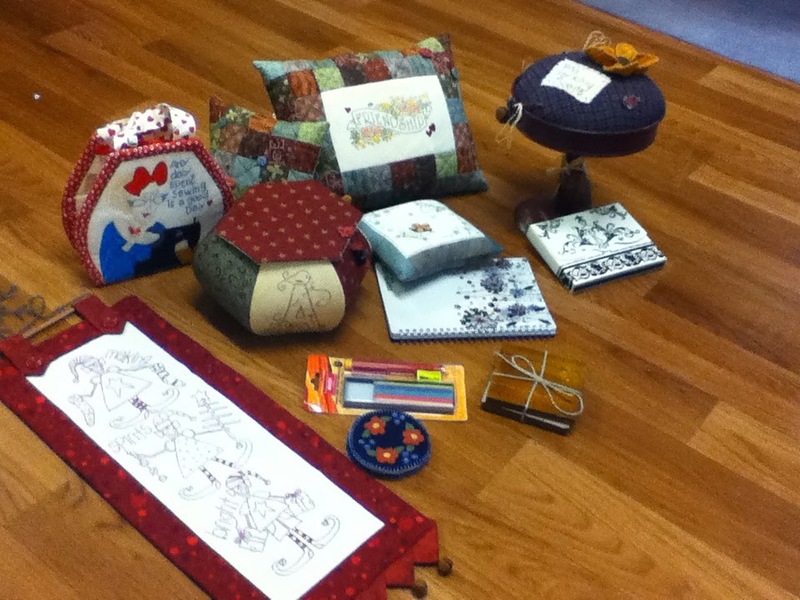 Below is a gathering of gifts made & shared at a stitching group I belong to. A rather late Christmas swap & shared dinner. Another couple of months & we could have called it a 'mid winter Christmas'!! Some gorgeous gifts received & given! Below, a collage of what I made my swap friend. 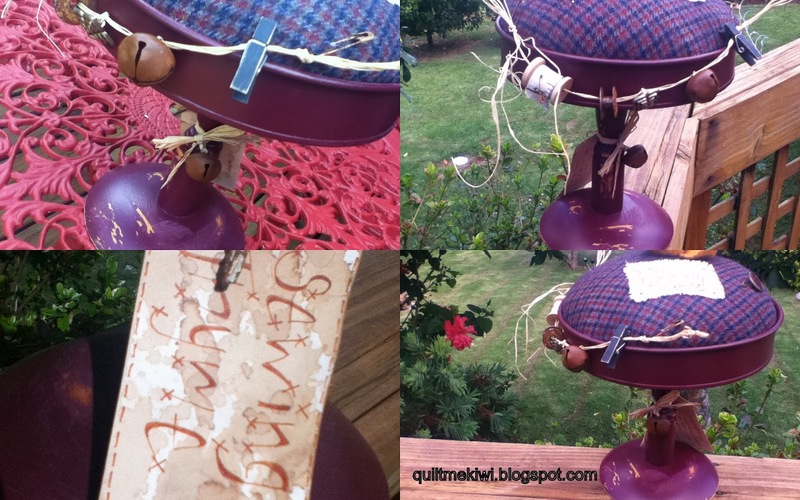 A pincushion made from one wooden coffee mug stand, one cake tin, wool felt & embellishments. Fun time with paint, glue & of course the needle! But the best part, the giving!!!! 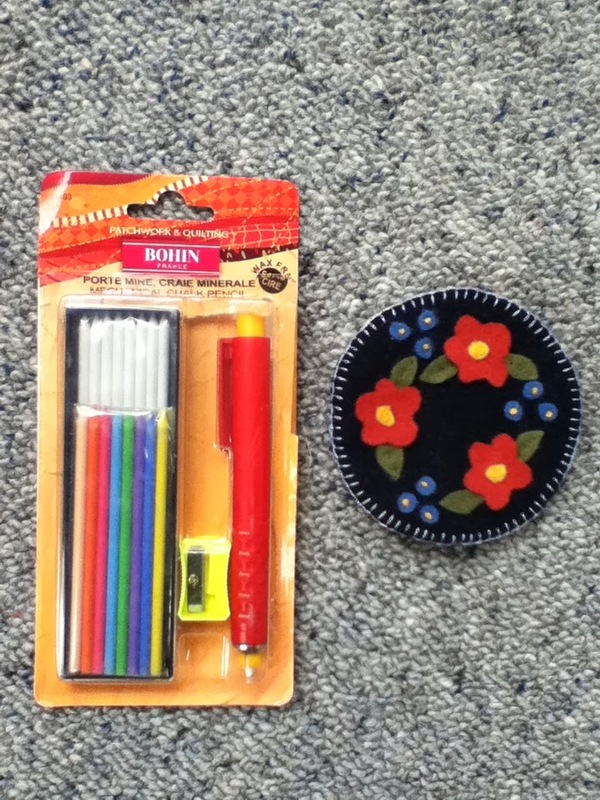 My gift was special, because my swap pal, really was listening one day when I mentioned in passing I would like to try the Bohin marking pens. My pal, then got her daughter living in London to send for these french designed pens. Also in my parcel a beautifully made wool felt needle case......thank you 'pal', you know who you are! 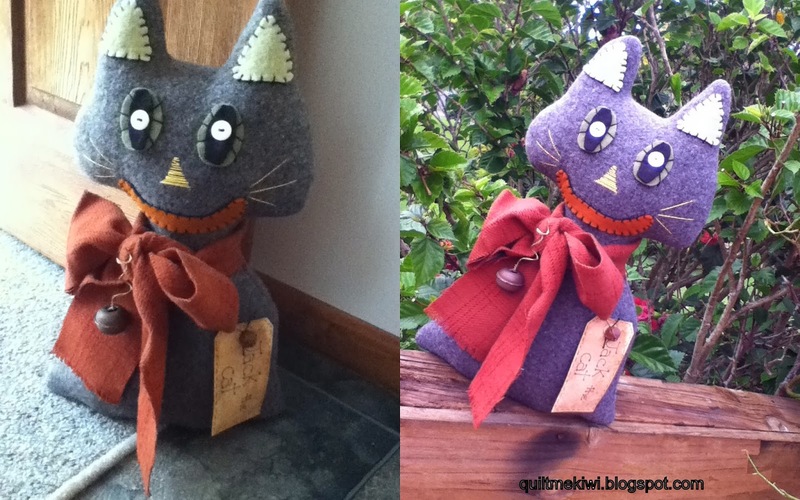 On a flying visit south, I visited my friend Julie & her lovely shop Threadbear Cottage. Look who wanted to come home with me?' Jack Cat! He is a heafty fellow that holds my door open when needed. Julie made his body with an old grey army blanket........love him! he should be cheap to keep too & hopefully won't go back to the old house! The postie is back with another quilt, so back to it! Until next time, take care. Wow Leeanne !!! 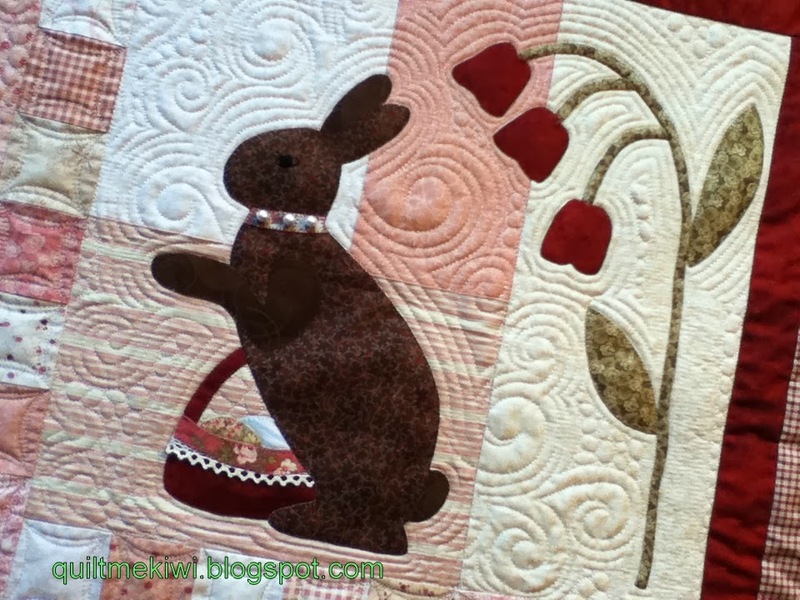 That is a simply gorgeous quilt - I love the colours you & Gaynor have chosen, all sort of eastery & chocolately looking. 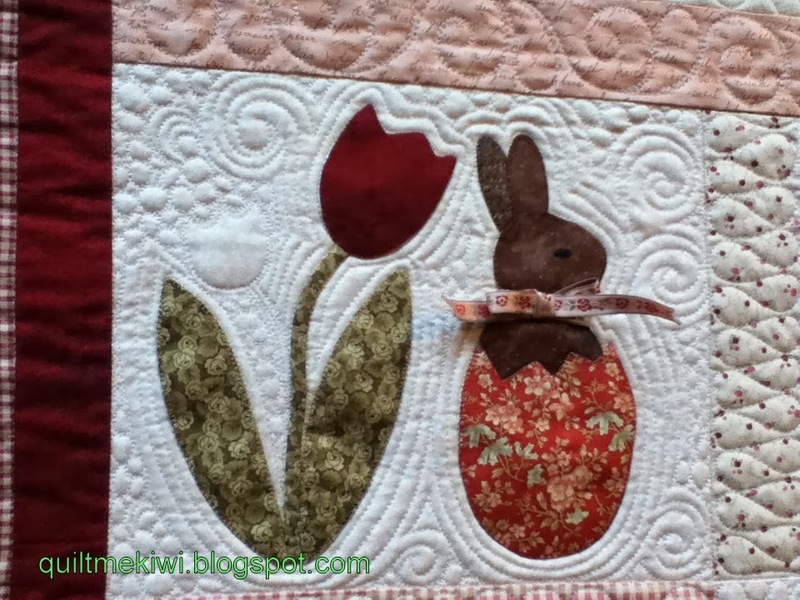 You have done an amazing job of the quilting - I adore that tulip. I wondered when you did the video of the piano key quilting if it was perhaps for that quilt. Absolutely stunning & will be lovely for Easter decor. Hi Leeanne - wow wow wow - Gaynor has made such a splendid quilt, and of course your work on it is simply stunning! I am sure that this quilt will become an heirloom piece for Gaynor as the years pass. Congrats yo you both! Gosh that's a very pretty quilt, perfectly enhanced by you quilting! 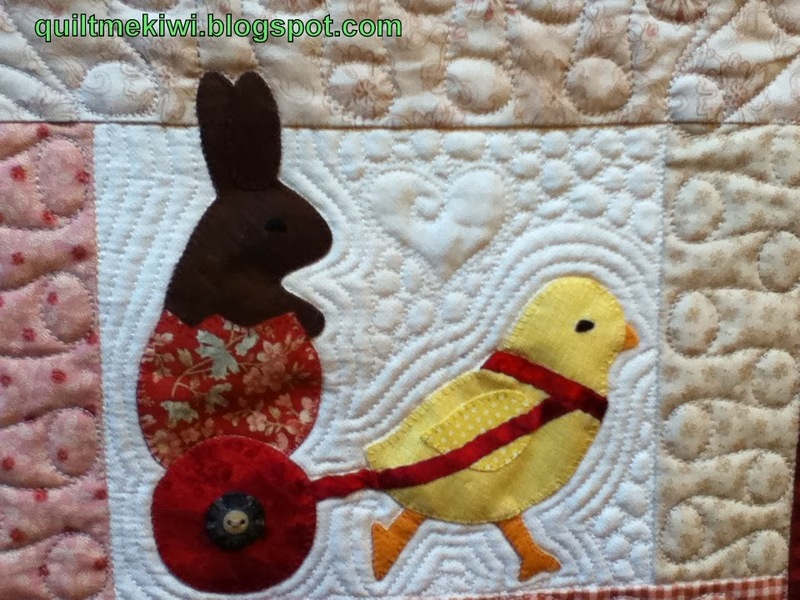 You have done a marvelous job of quilting this! I enjoyed enlarging the photos and studying your clever quilting in each block. Your group of stitchers exchanged beautiful gifts. I couldn't get enough of the purple pincushion you made! I agree with those beautiful bunnies!!! The quilt is gorgeous. Lovely gifts too. I received that marking set from a friend visiting the States and I love it...especially wonderful on darker fabrics. 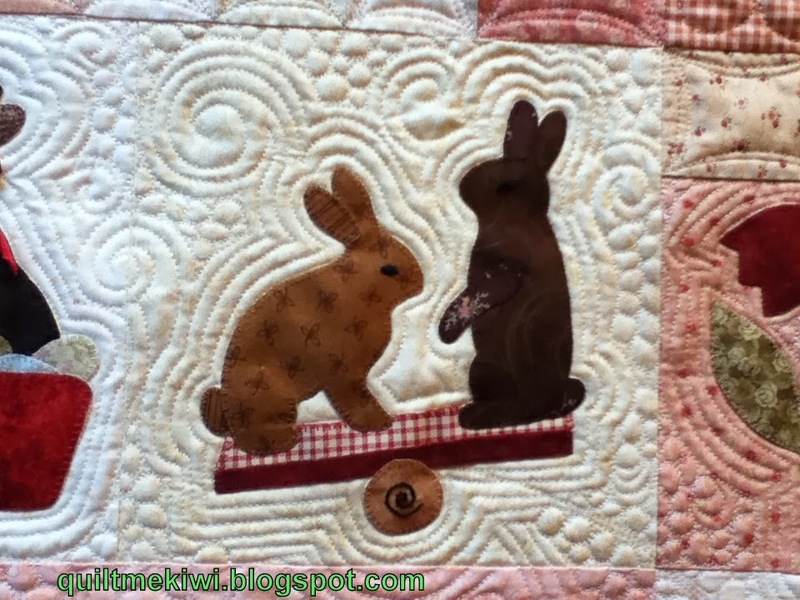 Love that bunny quilt - absolutely amazing quilting! Would love to see the original. And I'll be interested to see how you get on with the chalk pencils. I find they lose their point quickly, and also wear off quickly while machine quilting. So you wouldn't want to mark too far ahead. But they do have a great variety of colours which will show up on every single fabric there is - as long as you use them appropriately. 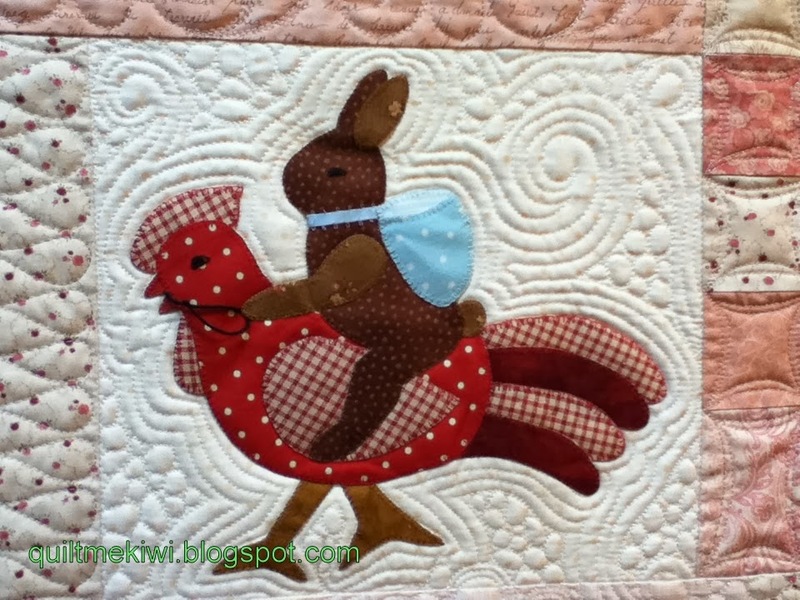 How amazing your quilt work is on that beautiful quilt! Nice you helped Gaynor choosing the fabric and also quilted the result! She will be proud to hang it at Easter. Love the gift you made and received. I forgot that lovely cat, ho nice, I think I couldn't have resisted him also! 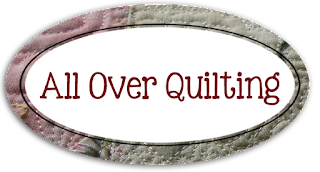 Love your quilting - as usual. Particularly like the way you jazzed up the echoing with some swirls and patterns. And haven't you got thoughtful friends? You'll have to do a review on the Bohin pens now.